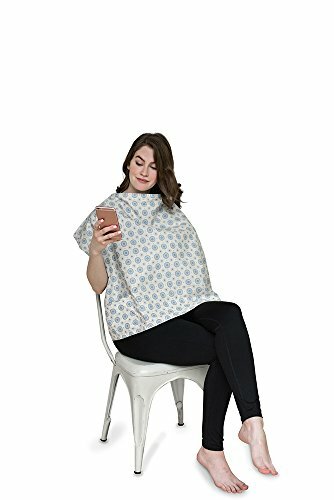 Belly Armor Nursing Cover is stylish, discrete and 99.9% effective at shielding radiation from cell phones, laptops and other devices. Belly Armor is the definitive resource for families looking to protect themselves against the harmful effects of everyday radiation, providing knowledge about the health risks from wireless technologies and designing products to help reduce exposure. Belly Armor products have won several awards including The Bump's Best of Baby in 2012 and 2015, and Pregnancy & Newborn's Top Products of 2014. Belly Armor has been featured in many publications and media, including The New York Times, Wall Street Journal, The Doctors, People.com, Newsweek, Mother & Baby, and The Talk. Reduces wireless radiation exposure: 99.9% effective at shielding radiation from cell phones, laptops and other devices. Does not shield against ionizing radiation such as X-ray or Gamma rays. Available in two designer colors - Aster (Light Blue) and Mint (Green). Please note product photo on box may not match fabric color ordered. Fabric color shows through side box window. If you have any questions about this product by Belly Armor, contact us by completing and submitting the form below. If you are looking for a specif part number, please include it with your message.